When the fixture list was announced, it is likely that Mourinho would have highlighted the away trip to face Joaquin Caparros’ Mallorca side an as awkward away fixture, particularly as it arrived immediately following a tough Champions League appointment away to Borussia Dortmund. Having suffered four defeats in seven away games in all competitions this season, this game should have presented some questions for Madrid and Mourinho to answer. What Mourinho would not have expected would be an insipid display from the hosts which enabled Madrid to win comfortably whilst performing well within their normal capabilities. Madrid cruised to a 5-0 away victory and the concern over fatigue both physical and mental never arose. With three full backs still missing, Essien was again forced to deputise at left back. 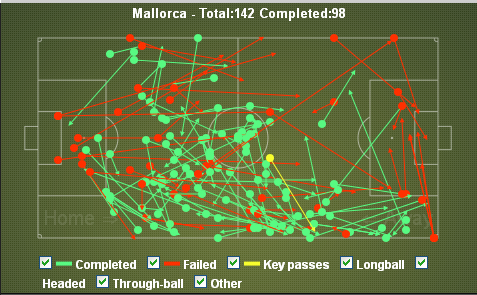 Mallorca repeatedly played passes towards their right wing. Initially Nsue started on the right and attacked Essien but all too often the attack broke down. Xabi Alonso moved slightly to the left to provide support to Essien but Mallorca failed to take advantage of any potential openings which did come their way. A more direct approach should have been adopted to try and isolate Essien quickly especially as he sometimes drifts into the centre which is to be expected as he is a central midfielder but too often the play from Mallorca was laboured. The final pass lacked quality whilst many attacks broke down through poor decision making. Mallorca ‘s best opportunity arose from a misplaced cross from Nsue which Casillas tipped over. Ironically, this came from an attack down the left flank. Despite Madrid being below their best, Mallorca never placed their opponents under any sustained pressure. The tempo of the game was seldom lifted by the hosts. This was definitely not a normal performance from a team managed by Caparros. When playing either Real Madrid or Barcelona , there are two key points which lesser opponents much adhere to. Don’t concede cheap goals and don’t concede early. Mallorca conspired to do both, finding themselves two goals behind after just 21 minutes and the game was effectively over as a contest. The opening goal arose when Conceicao needlessly gave away possession. Real Madrid gathered the loose ball and a pass was flicked through towards Higuain. Conceicao had regained his position well and was ideally placed to intercept the ball. Yet in his attempt to control the ball, he somehow managed to allow the ball to break off his thigh and into the path of Higuain who gratefully accepted this gift and scored the opening goal. The second goal was just as bad from a Mallorca perspective. Fontas was pressed and conceded possession just outside the penalty area. Now out of position, he was easily beaten and the ball was quickly worked to the opposite side of the penalty area before Ronald drilled a shot low into the corner of the net. This was Ronaldo’s 14th goal in the last 8 games and, incredibly, he now has an outrageous 164 goals in 157 games for Real Madrid. In the second half following Mourinho’s appearance in the technical area when he demonstrated his displeasure with the level of performance, Madrid stepped up the intensity of their play and scored a further three goals. Their passing and movement was much sharper now and a lethargic Mallorca simply could not compete. Following a recurrence of his hamstring injury during the game in Dortmund , Sami Khedira was replaced in the starting line up by Luka Modric who started in central midfield alongside Alonso. Khedira is often criticised yet when he is not in the Madrid team, it is easy to identify what he brings to the side. There was a lack of urgency about Madrid early on. They lacked the dynamism and industry which Khedira adds to the side. He may be one of the less glamorous players within the side, but his role is an essential part for the Madrid machine to function correctly. The differences between both players statistically is not that substantial and is broadly what you would expect. Modric play more passes and with a greater degree of accuracy whereas Khedira excels at the more defensive side of the game, making tackles and closing opponents down. 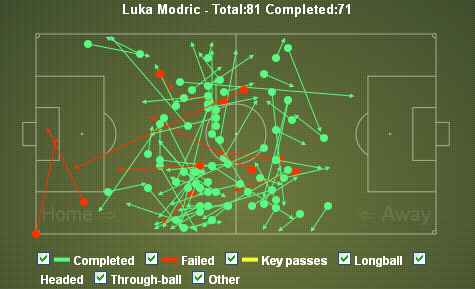 Modric became more involved as the game progressed and with hindsight, perhaps this was the perfect opportunity to embed himself within the Madrid system. Mallorca offered no challenge and Modric was able to find his feet and begin the process of adaptation. Modric operated ahead of Alonso and behind Ozil, able to move laterally as well in an effort to build play together. Once he fully adjusts to Madrid, the diminutive Croatian should prove his worth. Joaquin Caparros was clearly animated in the technical area for the majority of the game. Afterwards he spoke of Mallorca playing with no “intensity” and playing as if it was a “tribute match”. The defeat makes it four straight defeats in a row now for the Islanders with Barcelona waiting in their next home fixture. What began promisingly with an early season run of good form is now becoming a serious issue which Caparros needs to turn round. Whilst Mourinho was clearly displeased with the performance early in the second half, he will be content with an easy game which never asked any questions of his side. A difficult, physical encounter could have posed questions on the back if the Champions League game. Madrid now has their first back to back clean sheets in La Liga this season. A professional, almost perfunctory, performance from Madrid . They did what was necessary to leave with the points secured whilst conserving themselves for the tougher challenges which lie ahead.